As we discussed in our last post, Golf Carts are not ordinarily allowed to be used on Florida’s public roads or streets outside of self-contained retirement communities such as Sun City Center. What are allowed are “Low Speed Vehicles” (sometimes called “Street Legal Golf Carts”) which may be used on Florida roads with a posted speed limit of 35 miles per hour or less. So, what is a Low Speed Vehicle? Low Speed Vehicles are not only growing in popularity with individuals, they are also growing in popularity with businesses and public and private organizations. Under Florida Law, a Low Speed Vehicle is any four-wheeled electric vehicle whose top speed is greater than 20 miles per hour but not greater than 25 miles per hour. Low Speed Vehicles must comply with certain State and Federal safety standards and be equipped with a windshield; rearview mirror; head, tail and brake lights; reflectors; parking brakes; seat belts and vehicle identification numbers. Because Low Speed Vehicles are generally intended for “low risk” trips for neighborhood shopping, social, and recreational purposes, the safety standards for Low Speed Vehicles are much lower than those for standard automobiles. A Low Speed Vehicle must be registered and insured in the same way as a standard automobile and any person operating a Low Speed Vehicle must have a valid driver’s license. 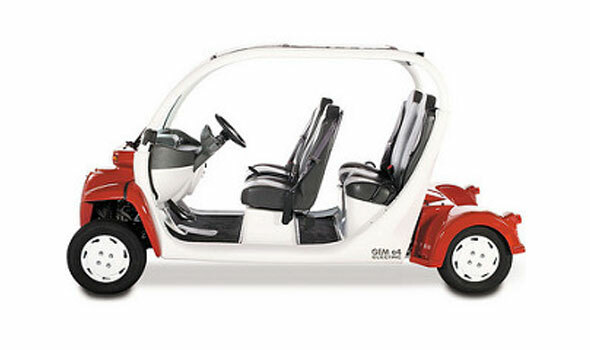 While some companies specialize in manufacturing their own brand of Low Speed Vehicle, like the Polaris® GEM® and Atomic Electric Vehicle, many Low Speed Vehicles are simply jazzed up Golf Carts. This is where the term “Street Legal Golf Cart” comes from, which means an ordinary Golf Cart which has been modified to meet Low Speed Vehicle standards. Stay tuned for more essential information about Golf Carts and Low Speed Vehicles, including safety and insurance information and where you can go right here in Bradenton to experience riding around town in a Low Speed Vehicle for FREE. Whatever your vehicle of choice may be, car, truck, motorcycle, Golf Cart or Low Speed Vehicle, our experienced accident attorneys are here to help if you should ever be seriously injured in an accident caused by someone else’s carelessness. Call us to find out how we may be able to help you obtain financial compensation for your injuries. We all heard the recent news of that luxury cruise ship that sailed right into weather so horrific that some passengers were fearful for their lives. So, how was it possible that the cruise line was unaware of the severity of the weather? Would you take out your boat without checking the weather first? Heintz & Becker Golf Cart Series Part 2: Everyone knows what a Golf Cart is – Right? Yes, we all know what a golf cart is – in the general sense. But, for purposes of Florida Law, a “Golf Cart” has a limited, specifically defined meaning. Florida Law defines a “Golf Cart” as a motor vehicle that is designed and manufactured for operation on a golf course for sporting or recreational purposes that is incapable of going faster than 20 miles per hour. While the operation of Golf Carts on public roads or streets is generally prohibited within Florida that prohibition has been lifted within a number of self-contained retirement communities, including Sun City Center, where all streets are approved for Golf Cart use by anyone age 14 and up. Sun City Center permits the operation of Golf Carts between sunrise and sunset. For safety reasons, Golf Carts may not be operated at night. The only safety features that Golf Carts are required to have are efficient brakes, reliable steering, safe tires, a rearview mirror, and red reflectors on the front and rear. It’s not necessary to have a valid drivers’ license, nor is it required to register Golf Carts with the Florida Division of Motor Vehicles or have a Florida vehicle License Plate. There is also no requirement that the driver or owner have any insurance coverage(although, as we will cover in an upcoming installment, we strongly advise against not having insurance). The rules we are describing are those in effect in Sun City Center as of the date of this post, however, it is important to keep in mind that the specific rules that apply to Golf Cart usage may vary from one community to the next and can change from time to time. Who Can Drive in Golf Cart Communities? Sun City Center and similar communities allow retirees who no longer have a drivers’ license or who no longer want to own an automobile to be able to maintain their independence and easily get from place to place within their self-contained community by Golf Cart. It’s easy to see how these communities can be especially helpful to seniors who can no longer drive an automobile due to health or other issues, but who do not want to lose their independence or have to rely on others for transportation. Our next post will explain what a “Low Speed Vehicle” or “LSV” is, what the term “street legal” means, and how certain upgrades can transform a Golf Cart into a “street legal” Low Speed Vehicle. Heintz & Becker is providing this information for our readers who either own a Golf Cart or a Low Speed Vehicle or who are considering buying one. Make sure to continue to follow our blogs for more valuable information on this and other important topics and remember that our experienced accident attorneys are here to help with your injury-related claims. The ever expanding medical evidence documenting the harmful effects of concussions has caused serious concerns about sports-related concussions in youth athletes. One particularly serious concern is an event that can happen in rare instances in young people who suffer a second concussion while still in the process of recovering from a previous concussion. Aptly called “Second Impact Syndrome” or “SIS,” it can result in catastrophic brain swelling that typically leads to death or severe permanent disability. Second Impact Syndrome has a staggering 90 percent mortality rate. Victims who beat the odds and survive are usually left with serious permanent disabilities such as severe cognitive issues or being unable to talk or walk. Doctors believe that the risk of Second Impact Syndrome is limited to high-school and college-aged individuals whose brains have not finished growing. As a result of this and other concussion-related concerns, the “gladiator mentality” of taking hits and getting back on the field is out and the consensus is that athletes who may have suffered a head injury need to be taken out of the game and evaluated. The latest guidelines from the Centers for Disease Control and Prevention provide that players with signs of concussion should refrain from playing until they have their physician’s permission to resume play and exhibit no symptoms with exertion. Many coaches and trainers have adopted a new the rule of thumb: “Safety first, if there’s doubt, keep them out.” In addition, it’s important for people to know that the issue is not limited to boys and football. It applies to both boys and girls in all types of physical sports. New Rules for Brain Injuries? Efforts to protect young athletes from concussions and their adverse effects are being made across the board. The rules of play are changing to reduce instances of helmet to helmet contact and efforts are ongoing to develop helmets that will provide better protection against concussions. Parents are being educated and discouraged from pressuring coaches to put their children back into games. Youth athletes are being encouraged to report any symptoms to coaches and parents. Ultimately, however, most people believe that it is the coaches and trainers of young athletes that must bear the principal responsibility for monitoring players, removing players with possible head injuries, and requiring those players to be evaluated and treated by competent medical professionals before allowing them to resume play. In addition, school districts and organizers of youth sports programs need to be responsible for making sure their coaches and trainers are educated about concussions and for implementing detailed concussion policies providing information and guidance for coaches, trainers, players and parents. The accident lawyers at Heintz & Becker support youth sports programs. At the same time, we strongly believe that no youth athlete should be allowed to practice or play if they are suspected to have a concussion until they have been cleared to play by a doctor who has expertise in evaluating and treating concussions. Anyone ignoring concussion symptoms and allowing a player to stay on the field or otherwise endangering the health or safety of youth athletes needs to be held accountable. If you are a parent of a youth athlete who has suffered serious harm due to the wrongful conduct of a coach, trainer or other member of your child’s sports organization, please call us and tell us your story. You may not only be entitled to pursue a claim for monetary damages, your actions may also help prevent the same thing from happening to someone else’s child.